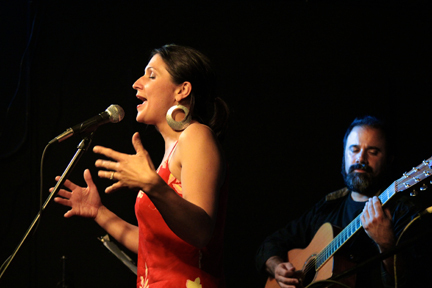 Chrissy Gardner and Robert Messore bring their version of acoustic soul to the Best Video Performance Space on Thursday, Apr. 11. The music starts at 8 PM and the cover charge is a sliding scale of $5-10 (pay what you can in that range). Chrissy Gardner is a singer-songwriter originally from Chicago, IL. Whether from behind a piano, holding a guitar or standing at the front of the stage with mic in hand, she belts out her tunes in a style that is often compared to both classic and contemporary singer/songwriters, but also has real shades of hard rocking Blues and R&B. On stage, Chrissy can effectively convey the depth of meaning in her music with her passionate voice and genuinely sophisticated and romantic piano playing, but when the time comes to get the crowd up and dancing, she can rock as hard as anyone. Robert Messore (meh-sor’-ee) has been called “Connecticut’s finest fingerstyle guitarist.” He plays beautiful instrumental guitar music and he is noted for composing tuneful pieces that work well as music, and not simply as fancy guitar playing. Robert has been called “the Heart of the New Haven Folk Scene” for his vital and many-faceted contributions as solo performer, side man, recording artist, teacher and concert presenter (working on several concert series and the Connecticut Folk Festival). When Chrissy Gardner and Robert Messore get together, their performances are full of vulnerability, triumph, and joy. Chrissy effortlessly embodies the spirits of soul, folk and contemporary music through her masterful songwriting and her shape-shifting voice that in one phrase can be as delicate and lovely as Joni Mitchell and in the next express the heart and soul of Janis Joplin. Robert has passionately devoted himself to the guitar for 30+ years and was voted Best Instrumentalist in a New Haven Advocate readers’ poll. Together, Chrissy and Robert make a kind of acoustic soul music that is sheer bliss. 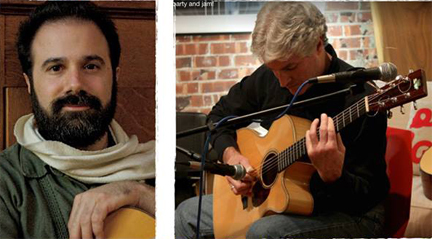 The contra dance trio Wry Bred plays the Best Video Performance Space on Thursday, Jan. 24. The music starts at 8 PM and the cover charge is $5-10 (pay what you can within that range). This is not your grandma’s barn dance! The contra dance trio Wry Bred engages in joyful musical conversations with driving rhythms and exuberant harmonies. With Julie Sorcek on flute and saxophone, Mickey Koth on fiddle, and Robert Messore on guitar, Wry Bred sensitively supports dancers and callers alike. The band was founded in 2009 and has been playing at dances, concerts, private parties, and other events ever since. They’ve developed a growing reputation and won the respect and admiration of dancers and music lovers throughout the area and beyond. The members of Wry Bred each bring years of experience as dancers and musicians. 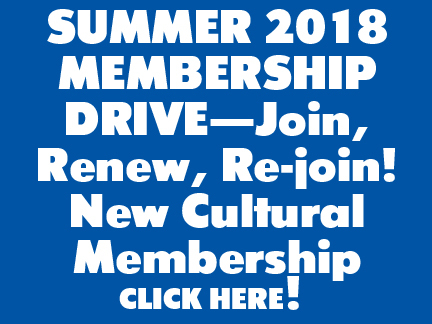 Wry Bred has played for contra dances in Connecticut, New York, New Jersey, and Massachusetts and, in 2011, with dance caller Bill Fischer, went on tour to North Carolina and Tennessee. Julie Sorcek has been playing flute since she was ten years old, and has been off and running ever since. She added piccolo in college, and has had extensive experience playing with high school and college symphonic bands, and in the late ’80s and early ’90s with the Danbury Community Orchestra. She also plays saxophone and occasionally bodhran and recently began lessons on the fiddle. She is a founding member of Wry Bred. Mickey Koth was a strictly classical player for the first 40 years of her life. Like Julie, Mickey began playing flute at age ten. As a music education major in college, she learned all the instruments, except double bass and tuba. Her favorites were the bassoon and trombone. At age 39, she started contra dancing and loved the music so much, she rented a violin for her 40th birthday and soon began studying with bluegrass fiddler and dobro player Stacy Phillips. Before the end of her first year playing, she had joined a pick-up band. She and John Kalinowski were the founding members of the contra dance and concert band Wild Notes. Robert Messore plays guitar in Wry Bred. He has passionately devoted himself to the guitar for 30+ years. Voted Best Instrumentalist in a New Haven Advocate readers’ poll, Robert has been called the Heart of the New Haven Folk Scene for his vital and many-faceted contributions as solo performer, side man, recording artist, teacher and concert presenter (working on several concert series and the Connecticut Folk Festival). He also plays guitar and bass with soul/rock group, The Chrissy Gardner Band, and presents a weekly program called Toddler Tunes, which is the largest children’s sing-along in CT! Robert Messore, left, and Stephen Nystrup, right. New Haven guitarists Stephen Nystrup and Robert Messore will perform at Best Video Performance Space on Friday, Sept. 14. The show starts at 8 PM and the cover is $8. Robert Messore (meh-sor’-ee) has been called “Connecticut’s finest fingerstyle guitarist.” He plays beautiful instrumental guitar music and he is noted for composing tuneful pieces that work well as music, and not simply as fancy guitar playing. Robert has been called “the Heart of the New Haven Folk Scene” for his vital and many-faceted contributions as solo performer, side man, recording artist, teacher and concert presenter (working on several concert series and the Connecticut Folk Festival). Robert has passionately devoted himself to the guitar for 30+ years and was voted Best Instrumentalist in a New Haven Advocate readers’ poll. Stephen Nystrup’s finger-style guitar playing is very rhythmically driven and has been described as “exceptional with a wealth of talent.” His music demonstrates unremitting tunefulness and bountiful invention with an ear for the unshakable melody and musical dexterity. His compositions have been heard on NPR and CPTV where he as Music Director along with the production team of “Amistad Legacy” won an Emmy Award. Nystrup—who will be accompanied by Aaron Nystrup on bass—continues to be at the forefront of composition and education in the country both as a Music Teacher and as a member of the writing team for the NAFME National Standards in Music.He produces a beautiful, identifiable, signature sound in concert on his Froggy Bottom guitar—which was his first love. 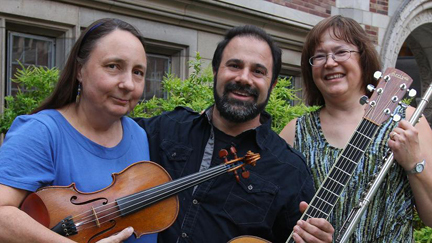 The contra dance trio Wry Bred plays the Best Video Performance Space on Wednesday, Aug. 22. The music starts at 8 PM and the cover charge is $5. 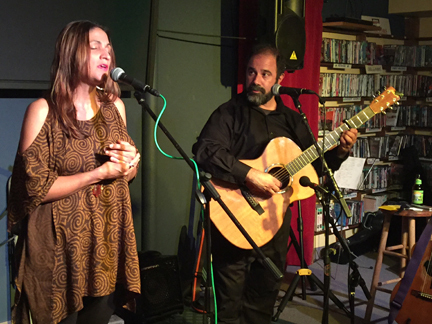 Chrissy Gardner and Robert Messore bring their version of acoustic soul to the Best Video Performance Space on Thursday, Sept. 14. The music starts at 8 PM and the cover charge is $5. Chrissy Gardner is a singer/songwriter originally from Chicago, IL. Whether from behind a piano, holding a guitar or standing at the front of the stage with mic in hand, she belts out her tunes in a style that is often compared to both classic and contemporary singer/songwriters, but also has real shades of hard rocking Blues and R&B. On stage, Chrissy can effectively convey the depth of meaning in her music with her passionate voice and genuinely sophisticated and romantic piano playing, but when the time comes to get the crowd up and dancing, she can rock as hard as anyone. 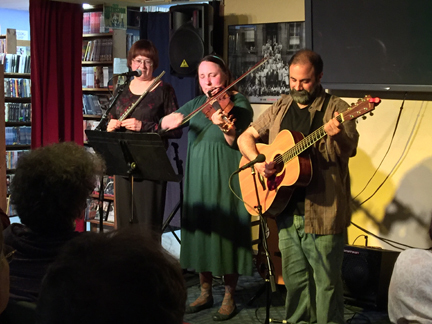 The contra dance trio Wry Bred plays the Best Video Performance Space on Wednesday, July 5. The music starts at 8 PM and the cover charge is $5. The contra dance trio Wry Bred engages in joyful musical conversations with driving rhythms and exuberant harmonies. • Thursday, July 6. BLUES ROCK: PARKER’S TANGENT. Guitarist Robert Messore brings a bunch of his friends to Best Video Performance Space on Thursday, Dec. 22, for a holiday show. The event starts at 8 PM and the cover is $5. 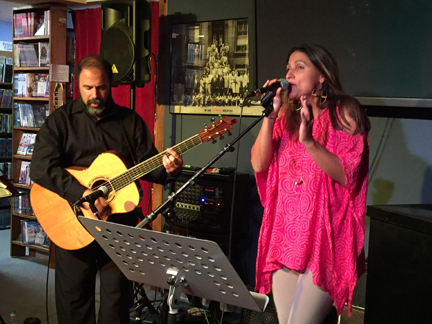 Chrissy Gardner and Robert Messore bring their version of acoustic soul to the Best Video Performance Space on Thursday, Sept. 15. The music starts at 8 PM and the cover charge is $5. 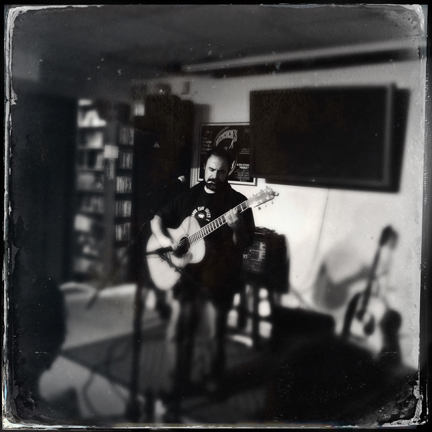 Robert Messore hosts an annual “Fabulous Guitar Night” every December 1st. But some things are so fabulous that they are worth doing more than once. 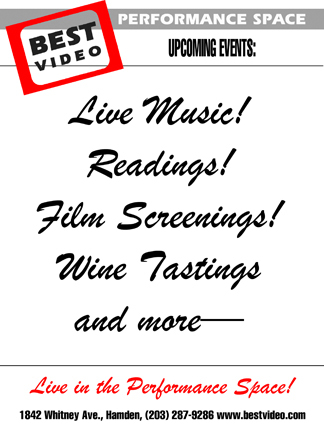 So it is that Messore hosts “Halfway to Fabulous Guitar Night” at Best Video Performance Space on Thursday, June 2. Along with Messore, guitarists Nancy Tucker, Norman Plankey and Shawn Persinger will play. The show starts a half-hour early at 7:30 PM and the cover is $5. Genre-Benders: Early each December, Robert Messore’s Annual Fabulous Guitar Night in New Haven gathers several of the state’s best guitarists from a number of styles of music. The event is well-liked enough that folks randomly walk up to Messore on the street throughout the year excitedly asking about the next one. So this year on June 2, Best Video hosts a “Halfway To Guitar Night” show for even more guitar loving goodness. The evening features Shawn Persinger, Nancy Tucker, Norman Plankey and Robert Messore, all of whom thrive on the multi-faceted love for all things guitar. Robert Messore has passionately devoted himself to the guitar for 35 years. Voted Best Instrumentalist in a New Haven Advocate readers’ poll, Robert has been called the Heart of the New Haven Folk Scene for his vital and many-faceted contributions as solo performer, side man, recording artist, teacher and concert presenter (working on several concert series and the Connecticut Folk Festival). He also plays percussion and bass. Lately Robert performs with contra dance band Wry Bred, with singer-songwriter Chrissy Gardner, and he presents a program called Toddler Tunes, which is the largest weekly children’s sing-along in CT.
Nancy Tucker blends outrageous squeaky clean comedy, spirited guitar instrumentals and moving songs of human experience in her shows for people of all ages. Her music and comedy center around a passion for life and laughter. 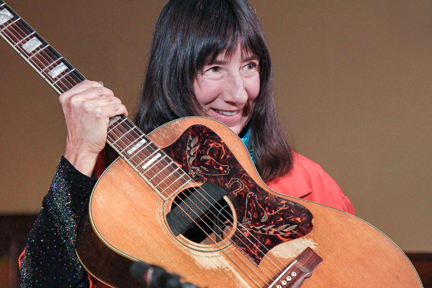 Her guitar instrumentals have been compared to those of Michael Hedges and Leo Kottke, with a flair for unusual and kinetic compositions using every part of the guitar, including a guitar attachment of her own invention. No matter what the venue, Nancy captures each audience’s imagination and heart with gentle invitation and contagious lunacy. 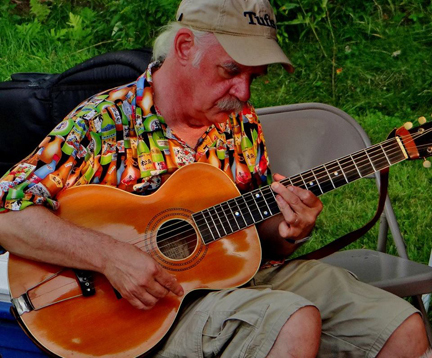 Norman Plankey is an in-demand accompanist/guitarist living in Oxford, CT. He currently plays regularly with Swing du Jour (Gypsyswing), The Fiddleheads (contradance), Norman and the Rockwellians (traditional jazz and swing), as well as The Brooklyn Swing Ensemble and One World Contra. A perennial favorite at Roxbury Pickin’ & Fiddlin’ contest, Norman has won many blue ribbons while pushing the envelope of what the judges might allow. • Sunday, July 24. INDIE, HIP-HOP: RUNNING LAPS & NATHAN CORP, THE FOREST ROOM, CHEF THE CHEF, ZAK G.
Robert Messore brings his take on acoustic music to the Best Video Performance Space on Wednesday, Mar. 16. The music starts at 8 PM and the cover charge is $5. Robert will play a program of Celtic music to celebrate St. Patrick’s Day (which is the day after). 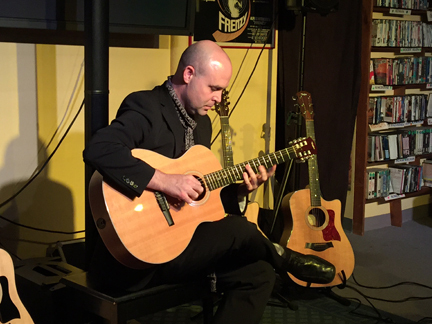 Robert Messore (meh-sor’-ee) has been called “Connecticut’s finest fingerstyle guitarist.” He plays beautiful instrumental guitar music and he is noted for composing tuneful pieces that work well as music, and not simply as fancy guitar playing. Robert has been called “the Heart of the New Haven Folk Scene” for his vital and many-faceted contributions as solo performer, side man, recording artist, teacher and concert presenter (working on several concert series and the Connecticut Folk Festival). Robert has passionately devoted himself to the guitar for 30+ years and was voted Best Instrumentalist in a New Haven Advocate readers’ poll.